DC actuator motor offers quick, quiet, and accurate autofocus performance to suit both stills and video applications. FE 50mm f/1.8 Lens is rated 3.8 out of 5 by 150. Rated 4 out of 5 by Kent H. from Great lens for the money I am very happy with this lens. The image quality is outstanding. I am sure if you did some close scrutiny of images comparing it to more expensive lens there will be a difference but it will probably be minor. I can't emphasize enough how happy I am with the image quality. The only downside I have seen with the lens is that it can hunter for focus in autofocus. It is also slower then more expensive lens in autofocus. So if you are doing photography that needs fast autofocus you will have to bite the bullet and get a more expensive lens. I am not shooting sports or wild life so it really isn't a problem for me. So a great nifty 50. Rated 5 out of 5 by Curtis K. from It's not as bad as some say... When I read online reviews on this lens I was a bit apprehensive about buying it due to the slow and noisy focusing. Well I tried one B&H at and I did not find any of these issues to be as glaring as others think. Is it a sports lens? Hell no! Is it noisy? Not to me. Is it sharp? Extremely. Does it focus quickly? More than quick enough for me. I shot many pictures in low light (1/125 @f1.8, ISO 8000) and I missed focus just once. Again, not sports, but someone moving around in a chair and me trying to focus on the eye. By the way, I am yet to update the firmware that is supposed to improve the focus issues. Rated 3 out of 5 by Wilt from FE 50mm f/1.8 Lens by Sony... Not so Fantastic Plastic You get what you pay for... Pro's: Price Light, small form factor Pretty sharp Nice bokeh at f1.8 close focus area at f1.8 color rendition looks good. Auto focus may be acceptable for shallow depth of field video (just as long as you don't move much) Con's: Auto focus constantly hunts (slow) Loud auto focus motor sound like heart pump (unacceptable to the pro shooter) No steady shot f1.4 would have been nice. Firmware update? Keep your receipt. The Rokinon 1.4 50mm may be a better option. I will keep it for now, as I need the bokeh and focal distance. Firmware update? Now you know why the Zeiss costs so much. Not a slam dunk to recommend to others. Rated 5 out of 5 by Robert from very little compromise for the price. a true gem. with the A7II. I've been able to achieve very food performance with sharpness and autofocus. There is some noticeable chromatic aberration at wider apertures, but nothing to cry about. It is very sharp in the center at wider apertures; I can shoot at f2 and crop deep. Autofocus performance also works really well with the following settings: wide-area + continous focus + AF-ON . I consitently get great results eachtime for street subjects, and I am a pixel peeper. Spot focus mode - I would avoid if you are having issues. If you know how to use the lens and camera competently, this lens is a must have. Rated 1 out of 5 by Juni from Not like other E mount lenses This product is not smooth focusing like other E mount lenses. It is sharp, but the continuous focusing action when taking still photos is clunky and noisy. Also, the one I got was defective in that it would focus using pre-auto-focus AFC while shooting stills, but would not focus while on the movie setting. B&H said it is defective so I returned it. However, B&H was fantastic in this return and customer service as usual. Good IQ but not for me. I have six E mount lenses and have owned 19 A mount lenses. I really love Sony cameras but be careful on this one. Rated 5 out of 5 by Ranelle from Firmware Version 02 Addresses Focusing Woes; Good Optics The Sony FE 50mm f/1.8 gives the first-time, full-frame mirrorless user a clearer picture (no pun intended) of what his a7-series camera can achieve. The lens allows astounding light transmission (T-stop) of T1.8, matching its advertised F-stop; rival lenses like the Nikkor 50mm f/1.8G has a transmission rating of T2.0. Additionally, sharpness is superior to comparable Canon and Nikon nifty fifties; many details are retained in the images even at F1.8. What deters many from buying this lens are the focusing woes. Sony, however, has mitigated the issue through its release of the version 02 that has noticeably improved focusing in low-light scenarios. With the issue of focusing addressed, the lens fits the criteria as a daily driver nifty fifty. Rated 5 out of 5 by Henry D. from A very nice modern fast 50 This is a nice, sharp, light, fast 50 with quick, native FE mount, autofocus. It's cheap and VERY good. This is NOT the ultimate bokeh smoothie; bokeh are smooth enough, but show onion rings. It also has a rather huge hood and the build involves a lot of plastic. So what? The bang for the buck is excellent. In sum, this is the fully modern version of the cheapie kit normal lens from the days of film SLRs. It isn't the best, but it is darn good, pretty versatile, and cheap enough that everybody should have one. This is really the lens that should come bundled with all the A7 series cameras. Is it compatible with A7Rii? Tracking focus in video mode? Yes, this lens is compatible with the A7R II and will track focus. How does a filter fit considering the lens moves when focusing? Fits fine. I use a UV filter and have no problem with the lens focusing. am used sony a6500 dslar camera,then am using this 50mm lence cut the frame? Your camera sensor is smaller the the lenses, so you will have no issue on using it. Your camera will work as it was using a 85mm-ish not 'cause of the lens, but cause of the sensor on it. Will work all right, but the image will be tight than if you use this lense in a full frame camera. 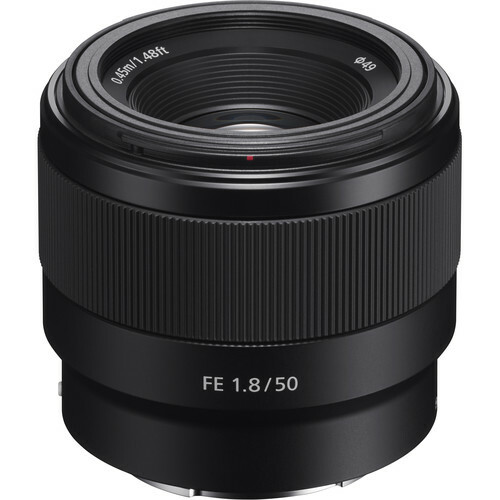 How will this lens compare image quality wise to the Sony Sonnar T* FE 55mm f/1.8 ZA Lens? Check the LensRentals blog comparing the 50/1.8 and the 55/1.8. The 55mm is clearly superior - but only if you get a good copy. LensRentals tested 8 55mm and 10 50mm and found the copy-to-copy consistency of the 50mm very superior to that of the 55 - which means that some 55mm will in fact be optically inferior to a typical 50mm. Having said that, the focus speed and accuracy of the 55mm is clearly superior. If a half-second is too slow for you, this may not be the lens for you. Does the lens come with a lens hood? Yes, it came with a lens hood. Does this lens focus by wire (like the Zeiss FE 55mm) or does it have the traditional mechanical focus mechanism? This lens is focus by wire. Is there any way I can order and pick up this item in the store the day of its release? When is the release date? Thank you. Pre-orders are prioritized for availability on new items, so they will be filled in the order they were received in. This lens is expected to begin shipping on May 4th, 2016, however please note that ths is subject to change based on availability. El Sony FE 50 mm f / 1.8 Lens es totalmente compatible con cualquier modelo de cmara Sony a7. En cuanto al precio, si agrega sus artculos a un carrito de compras de B &amp; H, puede calcular los costos de los artculos, los mtodos de envo, el tiempo de entrega, los impuestos y los costos totales muy rpidamente.